'Frizzy Lizzy' ( John Weiler, R. 1989). Seedling #84-111-BB-1. BB, 24" (61 cm), Midseason to late bloom. Crinkled ruffled dark flame orange; red orange beard. 'Oriental Knight' X seedling #82-156-1: ( 'Flaming Victory' x 'Perfect Accent'). Rialto Gardens 1989. Exhibition Certificate 1988, Honorable Mention 1991. 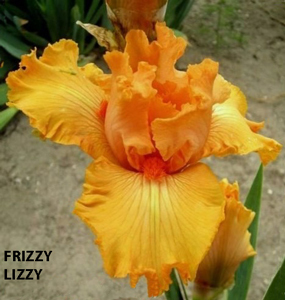 From AIS Bulletin #273 April 1989 Introducing FRIZZY LIZZY (Weiler 89) BB 24" M-L. A fitting feminine companion for Blackbeard, this is a beautifully formed flower of deep, brilliant orange sporting a darker orange beard. Proper size for a BB, the flower has widely flaring, crinkle-ruffled falls and domed, closed standards. Won best seedling of Fresno Show, 1988 and has performed in class in the Midwest. Very reluctant as a parent. (Oriental Knight X (Flaming Victory x Perfect Accent)). See our color ad on page 60. $25.00. Rialto Gardens.